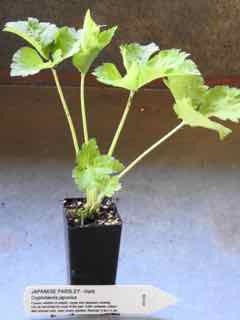 Japanese Parsley plant, Cryptotaenia japonica, is sometimes known as Mitsuba. A popular addition to salads, soups and Japanese cooking. Can be harvested for most of the year. A leafy and compact plant, it is suitable for container growing. Should be cut back in autumn and spring to encourage strong new growth. Japanese Parsley plant is native to Asia and prefers humus rich, well drained soils in an open sunny position. Drought and frost resistant. A biennial herb, growing to 0.3m x 0.3m. Be the first to review “Parsley, Japanese plant” Click here to cancel reply.